(Chris) The familiar sound of the watch alarm awoke the residents of my room at 5:15. Sam, Dave, and I went to the other room at about 5:35 to get the others, but they had decided to sleep in. 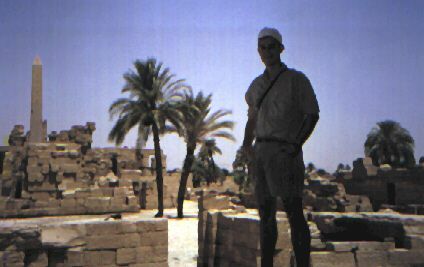 So, the 3 of us caught a taxi (5 pounds) to Karnak Temple, arriving before the late (as in not early, not as in dead) ticket booth guy at 6:05. WE WERE THE ONLY TOURISTS in the entire huge temple. We soaked it in as the hot sun began to do its work slowly on the cool morning. 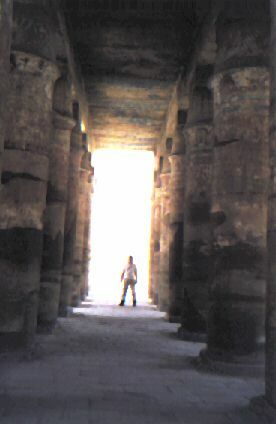 The entrance way was lined with ram's head sphinxes which Ramses had put to link this temple with the nearby Luxor Temple. The "temple guardians" showed us a few things and let us go onto some usually restricted roofs. 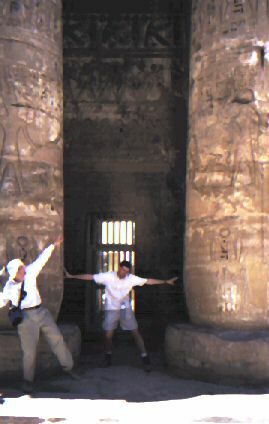 (Greg) The second expedition to the Karnak Temple consisted of me (Greg) and Matt. Joe decided to sleep (if that is what it can be called). We were equally impressed with the massive size of the ruins and since by this time the place was crawling with tourists, we listened to various tour guides. The temple walls were covered with scenes of the entire history of the new kingdom (c. 1450 - 1000 BC). Matt interpreted many of the scenes for me. He was well worth the 5 pounds he demanded of me when we finished. Before we left, we took a siesta under a fig tree talking with an Egyptian by writing in the sand. He seemed to enjoy the sign language as much as we did. Back at the hotel, we woke the rest of the T-weeds from their great slumbers and dreams of beautiful American hamburgers and discovered Dave (henceforth dubbed the group chaplain) had arranged Mass for us at Luxor's only Catholic Church. The Mass was a unique mixture of French, Latin, and English, said by a native Franciscan who had gone to the seminary in Egypt. After Mass, he invited us to a quick tea and there, in French (translated by Dave) and broken English, he told us, to our amazement that there were 5000 Catholics in Luxor. (Sam) The priest was very hospitable and made tea for all of us. Dave forcibly held the Franciscan's hand when he tried to pour Dave some tea. The four of us (not including Dave) enjoyed our piping hot tea. The priest then poured Dave some orange juice before Dave could refuse. Dave would not take it and told the priest that he was sick, "sort of." The Egyptian Franciscan was visibly confused and tried to offer Dave a Certs with flavor crystals. We were all still trying to tell Dave that it was polite to accept, but he took the package of breath mints and started to examine it. At last, after the priest inculcating to Dave that it was good and us threatening him, Dave cracked. Dave put iodine on the mint and reluctantly ate it. Life was good. (Matt) We walked quickly back to the Everest Hotel to make the 4:30 bus trip to Hurghada van ride. We waited till 5:30 till the bus came and loaded us up with a few other tourists - one of note we will mention later. Then, we drove around Luxor AGAIN for awhile, then ended up waiting with a ton of buses that ended up as a convoy through the deserts of Egypt. We finally rolled out feeling less smug because of the wait but still hopeful that our 20 pounds (the same price as an air conditioned bus) would get us to Hurgada in the 3 hours promised by the fella at the Everest Hotel. Well, to make a long story short, our bus did not have A.C. and it was passed by nearly everyone else in the convoy. The middle of the ride we left paved road, running through desolation into the desolation itself. The pavement stopped and we rolled up the windows (to sweat an incredible amount for the next 1/2 hour as we crossed to desert.) We realized our mistake as soon as we had closed the windows and broke water (began the sweat process). The dust was profuse outside the van. As the sweat trickled down our bodies and the dust swirled around the van, we were caught by our error. If we opened the windows now to cool off, we would be permanently covered in dust. So we saw and sweated and sweated and sat till I couldn't take it any longer and opened the window regardless of the consequences and let the dirt strike of it would. It was so cool with the windows down, I didn't regret the dirt covering my body. So on we drove. The entertainment I had hinted at earlier was a young lady we were privileged to "bump" into. Micky, from Deutchland near Hamburg. I sat back and watched the other guys enjoy her presence. (odd, very odd behavior for me). But she made the trip a joy for us all. We talked about her mostly; her tattoos, basketball skills, and long unfulfilled desire to go to the U.S.A. and work with horses. Dave seized the opportunity and told her that Kentucky is a great horse state and that if she wanted to she could come and stay with Sam and Louisville. She seemed to like the suggestion and quickly gave Sam a book to write his address in. Sam, in a quandry, shot Dave a dirty look, but seeing no escape obliged her desire. Eventually, 5 hours later, we arrived. We negotiated our hotel prices, switched hotels (for a $00.60 saving per person - wow! Are we getting good at this!) And hit the hay.